Find out what distinguishes two popular finishes, paint vs. stain, to get the right protection for your deck. Finishing a newly installed wooden deck or refinishing an older one will protect it from moisture- and weather-related damage and prolong its lifespan. While both exterior paint and wood stain can do the job, the two popular finishes differ in terms of appearance, applications, durability, maintenance, and cost. Read on for a comparison of painting vs. staining to learn which offers the best defense for your deck. Stain runs between $20 and $35 per gallon, while exterior paint suitable for decking ranges from $30 to as much as $60 per gallon. Plus, if painting, you’ll have to factor in an extra $15 to $40 per gallon of wood preservative and $15 to $30 per gallon of primer. Most commercial wood stains already contain a preservative and therefore don’t require a primer to adhere. Stain offers a natural look. Wood stain, transparent to semi-solid in opacity, partially fills the pores of wood, forming a thin film over the deck that lets both the natural grain pattern and superficial cracks in the wood show through—ideal if you like a natural look. Paint, with its high percentage of pigments and resins, fully fills the pores of the wood and dries to an opaque surface that hides cracks and covers the distinct wood grain, resulting in a more refined, though more manufactured, look. If you aim to disguise imperfections yet still retain a rustic appearance, a solid wood stain, which is highly pigmented and virtually opaque, is a good choice. Paint is available in a host of hues, from neutrals like chocolate brown or forest green to eye-popping royal blue or crimson for a more contemporary vibe. Because wood stain is designed to accentuate the native qualities of wood, it’s typically limited to clear varieties or shades of brown. Stain is easier to apply. 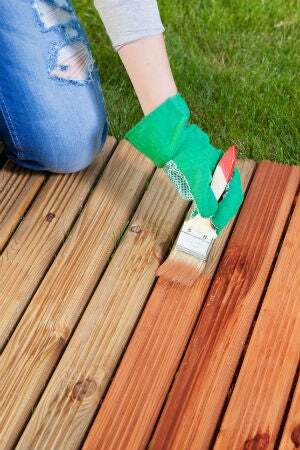 Either painting or staining the deck will require first preparing the surface by sweeping it clear, scrubbing it with a store-bought or homemade deck cleaner, repairing or replacing damaged boards, and then lightly sanding any surface ridges. Then, stain can be directly applied by brush or roller in a single coat. The rather runny consistency of stain prevents globs from pooling, and its transparency minimizes the appearance of lap marks in the finish. Furthermore, when you choose a two-in-one stain-and-sealer, like Behr Waterproofing Stain & Sealer (available on HomeDepot.com for $34.98 per gallon), there’s no need for an additional clear top coat. Conversely, prior to painting, a deck should be treated with wood preservative and then coated with a quality primer. A minimum of two coats of latex or oil-based paint is usually needed, and the thick consistency of paint means that globs and lap marks commonly crop up in the finish. Once painted, the surface must be sealed with a clear polyurethane sealer. Both paint and stain deck finishes are prone to unique problems—paint to chipping or peeling, and stain to heat-related discoloration. 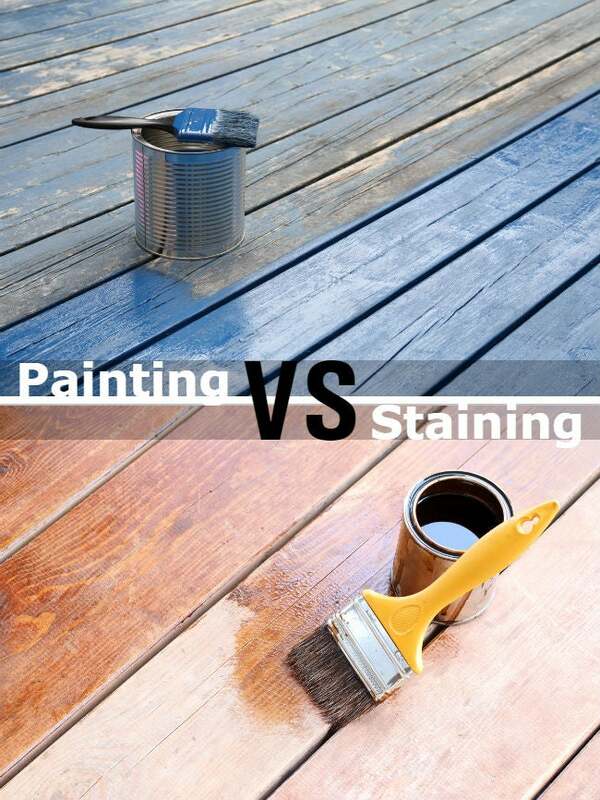 But in a head-to-head of painting vs. staining the deck, paint generally comes out as the more durable and colorfast finish, lasting 10 years or longer before requiring re-application. Oil-based paints offer the best protection from moisture, whereas latex paints provide the best defense against UV-related fading. 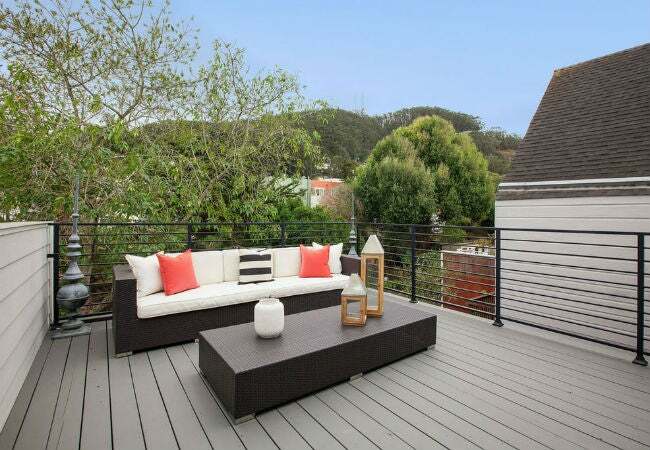 Stain finishes on decks are more short-lived, lasting from one to eight years before requiring re-application. Generally, the more pigmented the stain (i.e., the higher the opacity), the more resistant it is to moisture and UV damage. Transparent stains offer low moisture protection and virtually no UV protection, while solid stains offer high moisture and UV protection. Paint is easier to maintain. Even in low-gloss sheens, paint dries to a slick surface that makes sweeping away dust, dirt, and debris a cinch. Stain dries to a more matte finish that demands greater effort to sweep clean. This tempts some homeowners to take a pressure washer to their stained decks, but the sheer force of the washer can gouge the wood. The maximum washer setting shouldn’t exceed 600 psi for softwoods like cedar or 1500 psi for hardwoods like oak. At least once a year, you’ll need to deep-clean your deck, whether it’s painted or stained, to remove bacteria and mold. 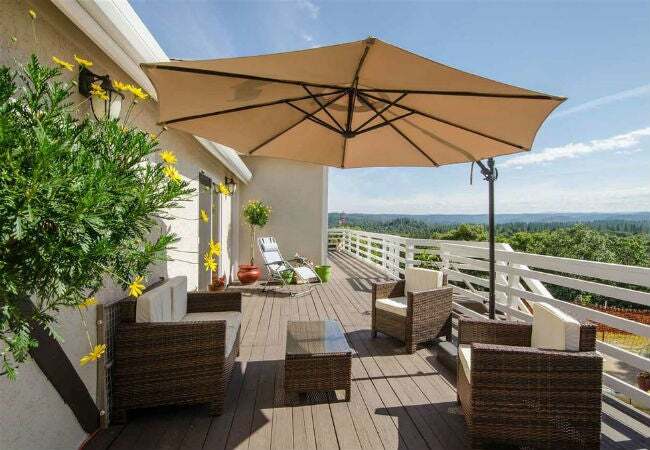 This involves applying a deck cleaner by sprayer or roller, scrubbing down any particularly dingy spots with a soft-bristle scrub brush, and then rinsing with a garden hose. Stain can easily be painted. A stained deck can be easily painted over or given a new shade of stain by dulling the old finish with sandpaper, wiping down the deck with de-glosser, and then priming and painting or topping with the new shade of stain. 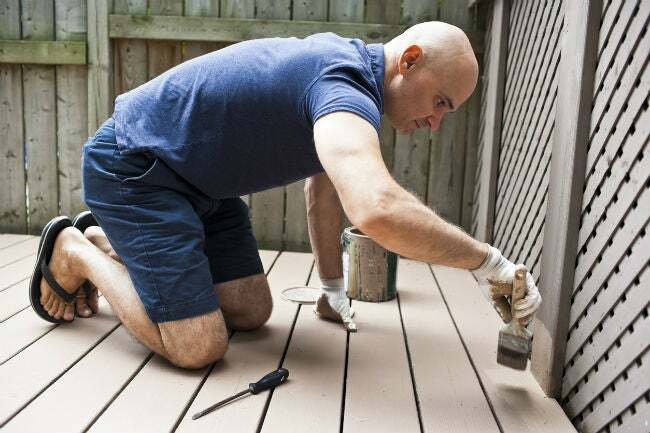 While it’s easy to paint over a painted deck, converting from a paint to a stain requires the effort-intensive process of completely stripping the old paint and primer with either commercial paint stripper or sandpaper, cleaning it with a deck cleaner, sanding deck imperfections, and then applying the stain.